In February, we launched a new section in our Court ADR Connection newsletter entitled My Favorite Resource. My Favorite Resource will feature brief interviews with individuals engaged in the world of alternative dispute resolution to learn what their favorite ADR resource is. For our inaugural post, our Resource Center Director Nicole Wilmet had the pleasure of reaching out to Heather Scheiwe Kulp, the Alternative Dispute Resolution Coordinator for the Office of Mediation and Arbitration in New Hampshire. Heather is also a former Skadden Fellow and RSI employee. During her time at RSI, Heather authored several resources that you can find here. 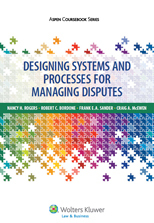 HSK: I frequently turn to Designing Systems and Processes for Managing Disputes, a “textbook” by Nancy H. Rogers, Robert C. Bordone, Frank E. A. Sander, and Craig A. McEwen. It’s much more than a textbook, really, as it has a comprehensive method for planning, designing, implementing, and evaluating dispute systems. So, I’ve found the resource translates easily between my multiple “hats,” whether I’m wearing my trainer hat, academic/professor hat, designer hat, or evaluator hat. HSK: It is written in a conversational, rather than high-brow, style, yet it is packed with data and additional citations. So, practitioners and academics alike can get what they need from it. I particularly appreciate that the authors start with theory and move to practical recommendations for how to implement best practices. It also includes really helpful case studies, showing you how actual people can do—and successfully have done—what they recommend. HSK: I was on faculty with one of the authors, Robert Bordone, at the Harvard Negotiation and Mediation Clinical Program. There, we implemented the design steps from this text in our clinic projects. We lived this material, and it was helpful to see how it played out in practice. HSK: The case studies are great examples of how DSD (Dispute System Design) principles can be tailored to address a variety of challenges, from international peacemaking efforts to online consumer disputes. It also makes DSD seem accessible; with this text, you feel like you could actually begin helping an organization, country, or societal system you care about manage conflict better. Do you have a favorite ADR resource you would like to share? If so, please reach out to our Resource Center Director Nicole Wilmet at nwilmet@aboutrsi.org!